One can leisurely cruise on the dappled waters at Kalipoika in both pedal and row boats. Boating time: 0800 - 1900 hrs. This beach is a favourite haunt of sunset viewers. Adding to its natural beauty is the old world charm retained in the old lighthouse and the two crumbling piers, each more than a hundred years old, that run into the sea. Entertainment facilities such as the Lions Park for children and the marine water aquarium are added attractions. This massive rock, much dreaded by navigators, was once a vantage point for the Marakkars to attack the invading Portuguese. An entire crew of a Portuguese ship was killed here. The beautiful natural engravings on the rock are worth exploring. The lighthouse which overlooks Velliyamkallu off Moodadi coast was built after a shipwreck, the remains of which can still be seen here. The region around the Velliyamkallu rock is the transit home of migratory birds. This is yet another beautiful stretch of golden sands with shallow waters that border Velliyamkallu. 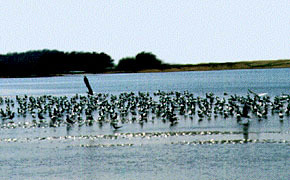 The estuary at Kadalundi is a haven for migratory birds. Terns, gulls, herons, sandpipers, whimbrels and other exotic birds flock into this place in November and return home in April. This picturesque damsite, teeming with exotic wildlife, offers excellent trekking and rock climbing opportunities. The best time to visit is between November and April. As the name suggests, land and water have struck an extraordinary kinship here. Famous for its trekking tracks, Tusharagiri is located near Vythiri in Wayanad. Trekkers start early morning from the second waterfall and climb uphill through the pristine, dense evergreen forests populated with exotic birds and wildlife to reach Vythiri by evening. Tusharagiri also abounds in rubber, arecanut, pepper, ginger and spice plantations. The Peruvannamuzhi dam site set amid hills is a beautiful picnic spot. The reservoir here provides facilities for speed and row boat cruises during which one can see the Smarakathottam - a garden built in memory of the freedom fighters of the region. Uninhabited islands, the bird sanctuary and a crocodile farm add to the charm of the place. Scintillating waterfalls and velvet green landscapes make this an ideal spot for trekking. The green ghats enroute to Wayanad has nine hairpin bends, each turn taking one to a higher altitude offering a better view of the picturesque plains below. This route explored by a tribal was developed by the British. 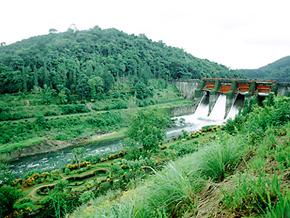 This picturesque village is the site of a major power project - The Kuttiyadi Hydro Electric Power Project. Unexplored, unspoiled, the backwaters of Kozhikode hold great promises of enchanting holiday options. Elathur, the Canoli Canal and the Kallai River are favourite destinations for boating. Kadalundi, with its beautiful bird sanctuary is a charming site. Korapuzha, the venue of the Korapuzha Jalotsavam is fast becoming a popular watersports destination.